Apple spent an all-time high $2.2 million lobbying Donald Trump's federal government between April 1 and June 30, 2017, according to a disclosure form filed by the Office of the Clerk of the U.S. House of Representatives. That amount is by far the most Apple has ever spent on lobbying in a single quarter, eclipsing the previous record of nearly $1.4 million spent during Trump's first three months as President of the United States. Apple has now spent nearly $3.6 million on lobbying during the first six months of his term. The extra $800,000 that Apple spent between April 1 and June 30 of this year, compared to January 1 to March 31, is its largest ever quarter-over-quarter increase in lobbying expenses. Apple had never increased its lobbying spending by more than $330,000 from one quarter to the next before now. Apple's surge in spending is perhaps no surprise, as the company has disagreed with Trump on a number of fundamental issues, ranging from his temporary immigration ban to withdrawing from the Paris climate agreement. "There are clearly areas where we're not nearly on the same page," said Tim Cook, Apple CEO, in a recent interview with Bloomberg Businessweek. Nonetheless, Cook has showed a willingness to work with Trump so far. By comparison, Apple spent $1.12 million lobbying between April 1 and June 30 of 2016, the final year of Barack Obama's administration, meaning it has nearly doubled its spending in just one year. Apple spent around $730,000 during the first six months of Obama's presidency, according to 2009 disclosure forms. Apple continued to lobby the government about issues related to corporate tax reform, climate change, diversity in the workplace, green technology, patent reform, privacy, education, accessibility, music licensing, and regulation of mobile medical applications, according to the latest disclosure form. Apple has gradually increased its lobbying spending over the past decade. In 2007, the final year of George W. Bush's administration, the company spent $1.3 million, compared to nearly $4.7 million in 2016. Apple is well on pace to smash that record this year after spending $3.6 million in the first six months alone. I can't stand the idea of corporate lobbyists... but if it has to happen, may as well be for good causes. "I hate lobbying unless it supports my own personal interests." 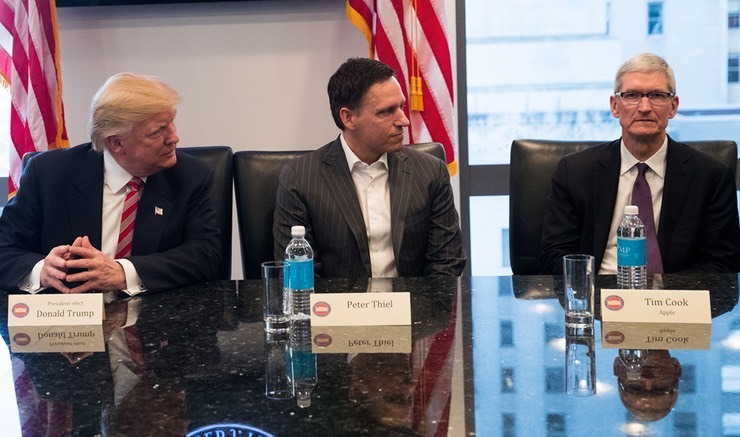 The administration met just last month with all the big names of Silicon Valley, Cook included, with the goal of overhauling technological efficiency among the federal agencies. By many accounts, it was a productive and successful week long meeting. Don't bother. Trump haters will never stop assuming that all conservatives are anti-technology and are solely comprised of old white men who want kids to get off their lawn. Not surprising when you have an administration that doesn't want to embrace technology. Funny from a group that goes on about being pro-business. Too bad Apple didn’t put those funds to improving Maps. My street which was made over 15 years ago still doesn’t show up on Maps. Edit: No, I don't support lobbying. I would whole-heartedly support a constitutional amendment to stop it entirely. I'm saying that in a world where it currently exists, we should hope Apple is doing so for the purposes that they publicly champion. Tim looks absolutely thrilled to be so close to the Gropper-in-Chief. Tech stocks and the economy disagrees with you. Have you looked at your 401K lately?